It was a wild night in Colorado Springs on the night of April 20th. And it had nothing whatsoever to do with the state-wide legalization of pot. 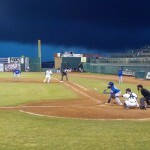 The Las Vegas 51s, the new Mets Triple-A affiliate took game one of their four game set with the Sky Sox, 10-6 (Box Score), and the wildness came from the mound. Maybe the pitchers got a contact high. 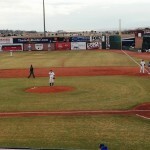 Aaron Cook started for the Sky Sox. The one-time ace of the Colorado Rockies staff is working his way back from CFSD (Coors Field Stress Disorder), trying to make an impact for a major league club again someday. But Cook looked nothing like his 2005-2009 self, when he was a ground ball machine who put up good high-altitude numbers (51-39, 4.07 ERA, 1.38 WHIP) for Colorado. 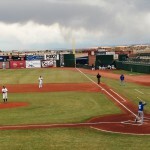 Cook set a new Colorado Springs Sky Sox record with four wild pitches in one game. In all, he went 5.2 innings allowing 7 runs, all earned on 8 hits. In a statistical oddity, he walked no one. That’s right, he uncorked four wild pitches, but didn’t walk a batter. 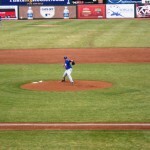 Not that Chris Schwinden and the 51s bullpen was any better. Schwinden went 5.1 innings allowing 3 runs, 2 earned, on 5 hits. He only tossed one to the backstop, though. Even when Schwinden was getting torched by major league batters last year, he was still throwing consistently 89-91. In this game, he was 85-87, ramping up to 89 only once or twice. 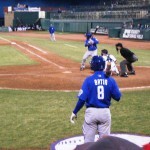 His curve ball kept the Sky Sox off balance, and ultimately helped get him out of trouble enough times to earn the win. If you’re a Mets fan looking for bullpen help from the minors, stop. Gonzales Germen and southpaw Sean Henn allowed a combined 3 runs on 5 hits in 1.2 innings, allowing the Springs to pull to within one run of LV’s lead. Henn tossed 2 more wild pitches to bring the game’s total to 7. 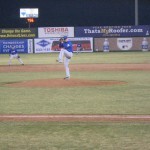 But Greg Burke threw 2 scoreless frames to earn the save. Burke looked good, getting ground balls with that submarine delivery. One of the hits he gave up was a weak chopper between first and second, that I felt second baseman Wilmer Flores could have knocked down with a dive. As for Burke, his release point seemed inconsistent. Sometimes he’d go to more of a 3/4 delivery against left-handed batters, perhaps to make the ball tail away. Sky Sox rookie manager Glenallen Hill tried to get some long relief out of RHP Jeff Manship, even allowing him to bat with the tying run on third and 2 outs. Perhaps the Sox bullpen needed a rest, but the decision to leave Manship in to bat for himself may have helped the 51s retain their lead. But at least Manship was in long enough to throw the games 8th and final wild pitch. 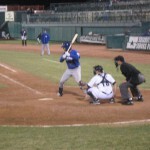 LF Jamie Hoffman was Vegas’s offensive hero, going 3-5 with an RBI. 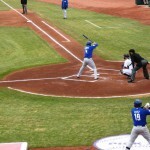 He showed impressive power to the opposite field, once while stroking a double in the first, and again while flying out to the wall in deep right-center. On a managerial note, Wally Backman rightly admonished Lagares for not sliding into second on a close play. Backman was forceful, but didn’t show his player up. The rains and the winds came in the ninth, but the Mets already opened up a 10-6 lead, and Burke nailed it down. Juan Lagares leads off the game. 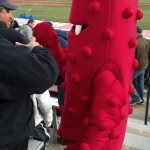 I’m told this guy’s named “Muno.” No relation to Mets prospect Danny Muno. An ominous sky as new catcher Juan Centeno sac bunts. 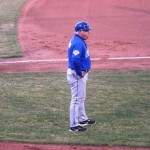 Here’s Wally Backman standing a few feet away from an umpire without throwing stuff at him. Josh Satin awaits his turn as a pinch hitter. 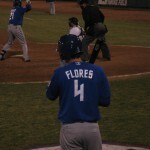 …Wilmer Flores, now at second.